Recently I’ve noticed some of my favorite LFS hot spots have been stocking lookdown fish (Selene vomer). 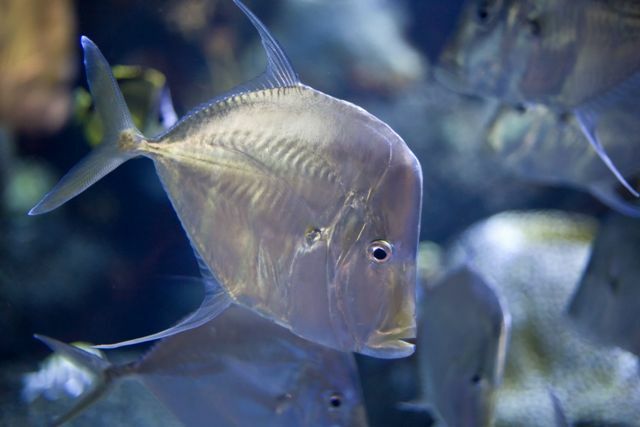 The lookdown is an easily recognized fish with its tightly packed metallic scales, thin disk shaped body, and visible spine structure. The prices, seemed reasonable for such large and unique fish, but their temporary homes seemed unfit. I decided to research lookdowns and share the habitat needs in hopes of sparing some casualties. After all, many a newbie could find this attractive and affordable fish enticing and give it a whirl. First of all, the fish prefer to be kept in schools of 5 or more. Now with each fish coming in at about $85.00, the investment just got a little steeper. Their actual aquarium needs, if researched should deter most potential suitors. For a juvenile lookdown, a tank no smaller than 125 gallons will do, but as they age the minimum tank requirement sky rockets to 900 gallons. For some of us, we could easily be talked into upgrading our systems to meet at least the juvenile requirements or even handle the adolescent mid-range, but the deal breaker is yet to come… Nothing should be in the tank other than the lookdowns. They prefer a soft sand or silt bed without rocks, corals, or any form of obstacle. These fish are open water dwellers and for long term success that needs to be replicated. The lookdown is in line to be a popular trend in poorly kept aquaria, just like stingrays and small sharks have been for the past decade. A responsible LFS would educated anyone interested in buying one of these beauties, but then again if the LFS is keeping them in a 20 Long, how responsible can they be? If you are interested in this unique fish, do your research and plan for their growth.